An artist knowns the way beyond perception, truly, enigmatism of 'doors' , which have borne testimony of so much of history , can never be overstated for the salvation clearly lies ahead as we cross our own doors of perception. As a being, there are several perceptions which are beyond anything and if those perceptions are cleansed, everything will become crystal clear. Man has captured himself in those mighty perceptions, whose shackles are need to be broken. Those perfections take form of our emotions and expressions. Based on this concept, artist Sunita Agarwal paintings speaks a lot about the hidden insecurities of man, which he perceives and take it with him for the life time. "art is the most intense mode of expressing one self". 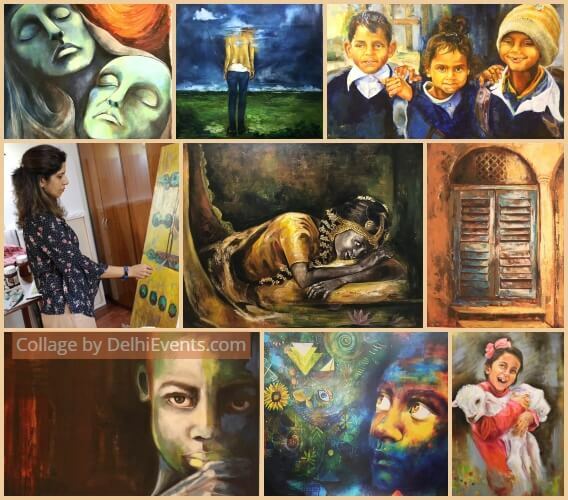 The images used in her paintings are intense with hues of bold as well as subtle colours that define different stories. The door of perceptions is an amalgamation of several untold stories that is a visual delight to watch. Born In Kolkata, the mecca of art and culture, Sunita was always drawn towards human emotions and expressions. ; to her , it was magical to be able to put them on canvas which enthusiastically motivated her to become realistic artist. She started creating, at a very tender age of 4. It was in the year 1987-90, during her learnings at Birla Academy of Art and Culture, that she did ample of work which was also appreciated by many and which opened her doors for future endeavours. There is always a story telling element in Sunita's creative process highlighting social issues on woman and children. It illustrates her perceptions,feelings,sentiments and translating them through line with subtle play of colour. Overseeing the famous Pandal of Mudiali in South Kolkata...which was thronged by masses night long - vibrancy of colour insinuated the thoughts and vision of Sunita which took a unique form in her paintings .Her work is evocative and reflective of varying shades of human emotions and to bring those new perspective of emotions is her aim. Sunita has her hands on Acrylic art along with oil, charcoal and pencil.